Wow how things have changed in Vaughan! Normally I only visit the city, a short drive from Toronto, when going to Wonderland so it’s shocking to see how developed and thriving the area’s become. Even the culinary scene is growing – aside from the chain restaurants and authentic Italian joints, a wealth of diversity is springing up. 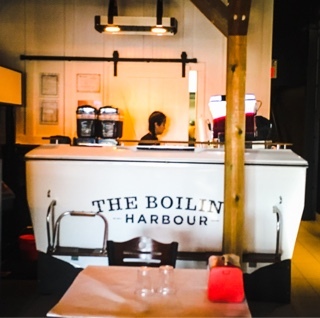 This summer, a new entrant joins them: Boiling Harbour brings the Louisiana boil to Vaughan! In the Southern states, a seafood boil is not merely a dish, but rather a social event bringing together communities, friends and families. You should definitely keep with the tradition and arrive in a group so you can try numerous items. 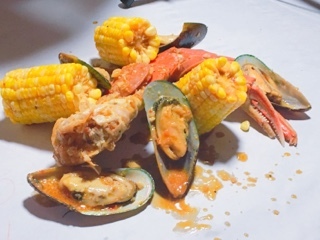 During the opening event, we sampled skillfully prepared snow crab legs ($18.95/lb), large meaty mussels ($10.95/lb) and head-on shrimp ($12.95/lb) so you can really enjoy the seafood essence. The Harbour sauce (a mix of garlic butter, lime, pepper and Cajun spices) was just spicy enough at the medium level and thankfully not overly salty or oily to detract from the seafood. Some of the add-ins are a tad pricy (corn for $1 or sausages for $6.50 apiece), but the sweetness of the corn goes so nicely with the hot spicy broth and I like that Boiling Harbour used fresh ears (at least during our summer visit) compared to the chewy frozen variety. Having had gumbo ($9) in New Orleans, the hearty flavourful stew at the restaurant is impressive. In particular, it was a smart idea to cook the shrimp separately so they didn’t turn rubbery and there was enough okra to thicken the broth but not turn it slimy. 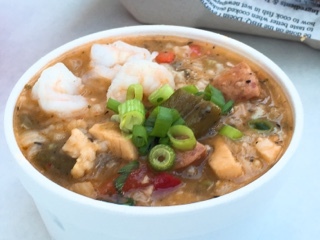 The gumbo is fantastic and is better than the ones I sampled in Louisiana. 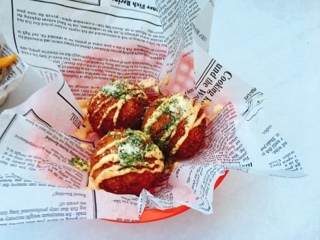 The lobster mac & cheese balls ($15.95 for three) are huge and great for sharing. Although the mixture doesn’t contains tons of lobster, the pasta was cooked well and there’s enough sauce so that the insides are gooey when the crispy crust is broken. Once you see an order of the loaded lobster fries ($28.95) go by, you’ll want it. It’s a serious dish with an entire boiled lobster that’s flash fried and drizzled with garlic butter and aioli. There’s definitely enough lobster to share, but it’s so good that it’ll be hard not to devour the other half. 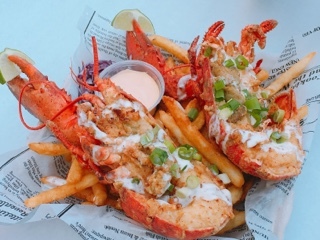 As if it weren’t enough, the crustacean sits on a bed of hot Cajun fries – perfect for dipping into the boil sauce. Dinner at the Boiling Harbour was delicious and I truly love the experience. It’s a shame, as the one thing that keeps me from frequenting these restaurants is the amount of waste generated – the boil is served in food safe poly bags, other items in Styrofoam or paper plates, and all the utensils are plastic. 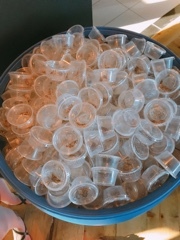 Every person even received a small plastic container of salt and pepper … the barrel of them on display really doesn’t go with the seafood friendly theme. I understand, disposables are easy: there’s nothing to wash and little up-front investment. To be fair, Boiling Harbour isn’t the only restaurant that relies the ease; competitors do this as well. Although I’m not an environmentalist, I still care about what we do to the Earth – after having a delicious meal, the worst feeling is the guilt felt while staring at all the waste you’ve created. So, I’d encourage restaurants to gradually improve their impact: like those individual salt and pepper containers? That can easily be replaced with shakers that’s given when requested – seriously, the food is already well-seasoned, I don’t see why it would be needed anyways. Then as cash flows allow, start purchasing utensils, re-usable plastic serving platters, cups, and transparent pails to serve the boil in (the photographs would turn out much better than bags). If only the entire experience wasn’t so wasteful, I’d certainly go back more frequently. I already have a hankering for another helping of boiled crab legs, loaded lobster fries and gumbo. Maybe next time I visit there will be real utensils, then I can leave feeling full and guilt free.